Did you watch the interview last night on Larry King? If not, read the transcript and watch portions on CNN.com. 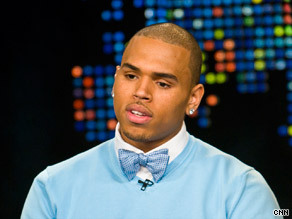 Chris Brown said he hasn't talked with Rihanna in several months, and still loves her. His mother told Larry that her son has never been violent person. Nearly nine in ten Americans say the country's still in a recession, according to a new CNN/Opinion Research Corporation national poll. But some economists think it's just about over and there are positive signs with consumer spending, residential construction and technology sales gaining. What do you think? Take the Quick Vote poll or leave your comments. The alleged “slapper” was arrested and charged with first-degree cruelty to children. This story has made us reminisce about our own encounters with unruly children. We’ve laughed. We’ve cried. And now we want to hear from you. When you’ve met up with a screaming child in a public place…have you ever said anything? Done anything? Wanted to say or do anything? Share your stories here.